Play in the World Series of Poker Event 57 in Las Vegas this summer with Team RedKings. RedKings will host online satellites to the WSOP 2015 Side Event 57. Each online satellite offers at least one prize package enabling RedKings players to win seats to this WSOP 2015 tournament. All players will be staying in a room in the classic "MGM Grand". 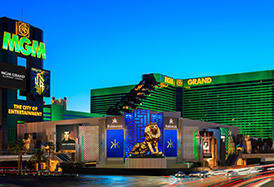 MGM Grand highlights include: David Copperfield, Cirque du Soleil, Brad Garrett Comedy Club, CSI The Experience. MGM Grand restaurants include five award winning chefs: Joel Robuchon, Emeril Lagasse, Tom Colicchio, Wolfgang Puck and Michael Mina. The hotel rooms for the Event 57 package are booked from June 25 – July 3. If a player would like to extend the stay, the player will have to arrange for his accommodation. Ongame might be able to assist. The hotel booking includes free internet. * If a player would like to extend the stay, the player will have to arrange for his accommodation. If you wish to buy-in directly to the Side Event just contact accountmanager@redkings.com. Player must be 21 years of age at the start of the tournament(s) included in the package. Package is personal and may not be transferred unless specific approval is given by site. Player approves that the site to use his or her personal details for registration, administration and marketing purposes. Player is solely responsible for following instructions provided by site regarding for example tournament registration, sign-up, gear pick-up and hotel check-in. Site retains the right to change information about this event at any time. Site retains the right to cancel the event and replace the package with a package of equal value to another event of the sites choice. If player wins multiple packages, additional packages of the same type will, at the discretion of the site, be converted to another live event package of the same value. Failure to comply with any of these terms may - at the sole discretion of the site - lead to player forfeiting his right to all or some elements within the package such as buy-in and/or accommodation. Player must wear branded gear (clothes etc) made available to player at location or in advance. Player may not, while playing any event included in package, represent another site or sign sponsorship with any other gaming operation.